1977 - was born in the city of Ryazan, Russia. 1988-92. - Study in Children's art school #1 (Ryazan). Teacher: Cheremin Valery. 1992-98. - Study in the Ryazan Art College. G. Wagner. 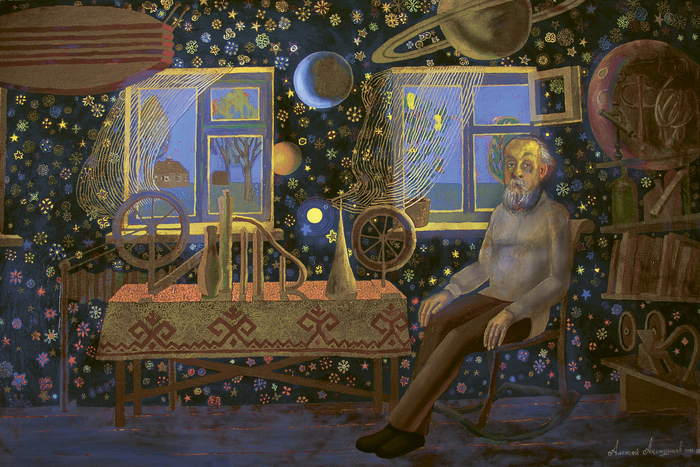 Teacher: Viktor Korsakov (Honored Artist of Russia), Alexey Kozlov (Honored Artist of Russia, 1923-2011), Tatiana Vlasova (member UAR), Presnyakov Anatoly, Lyakhov Vyacheslav. He graduated from college with a degree in painting, the artist-educator profession. Thesis "Astrologer" rating "excellent". Reviewer - People's Artist of Russia - Mikhail Abakumov. Since 2001 - member of the Union of Artists of Russia, the International Association of Fine Arts - UNESCO AIAP (painting department). 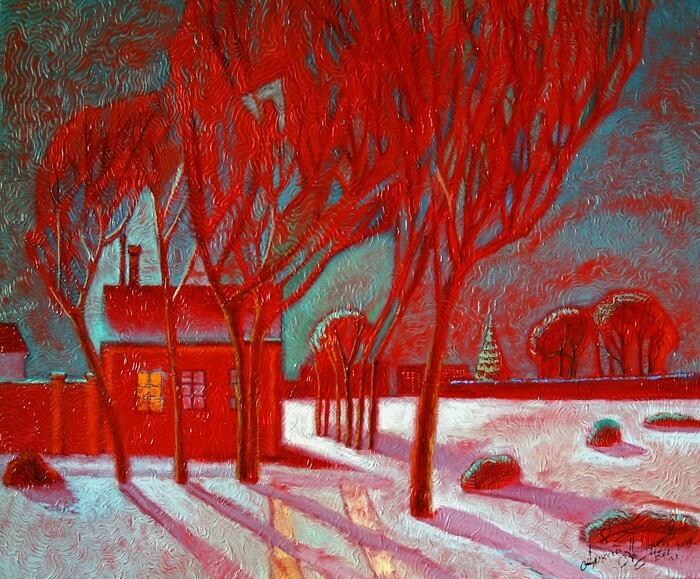 Since 2007 - Member of the International Art Fund, the Moscow Association of Artists, specialization - painting. Since 2010 - a member of the Union of Artists "Realism of New York", New York, USA. 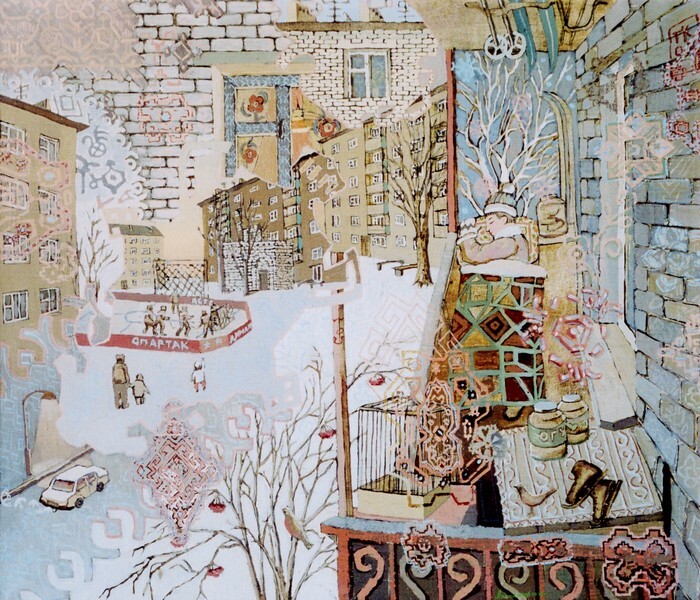 2008 - Winner of the National Award in the field of contemporary fine arts in Russia "Russian Gallery XXI Century". 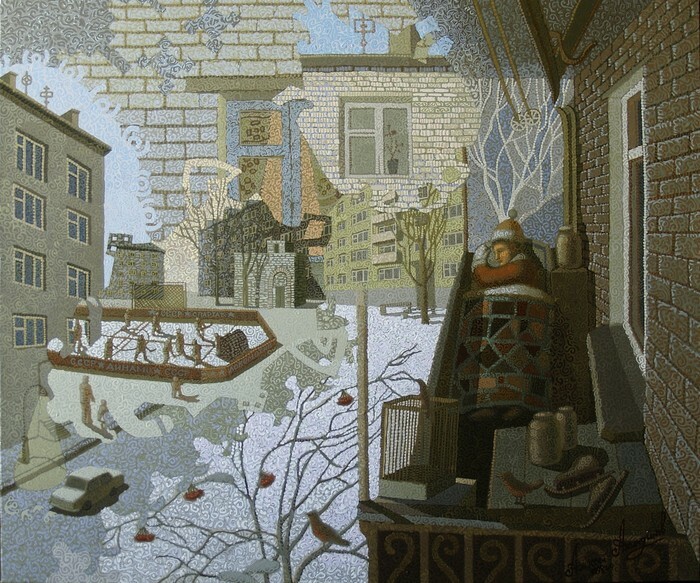 Silver medal "Russian Gallery XXI Century". 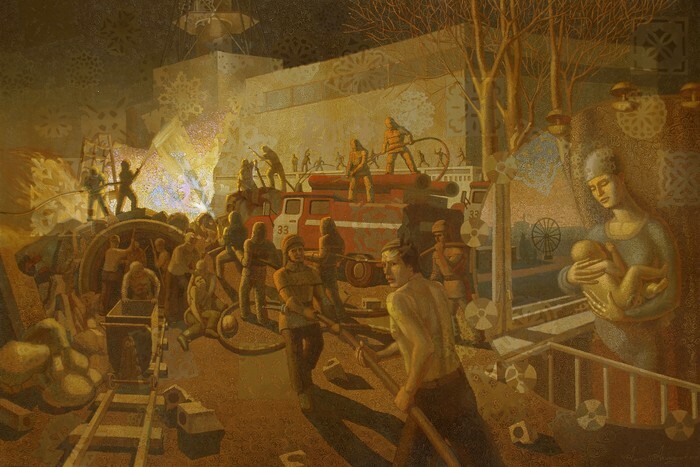 "Genre painting" nomination. Venue - Moscow, "Federation Council". 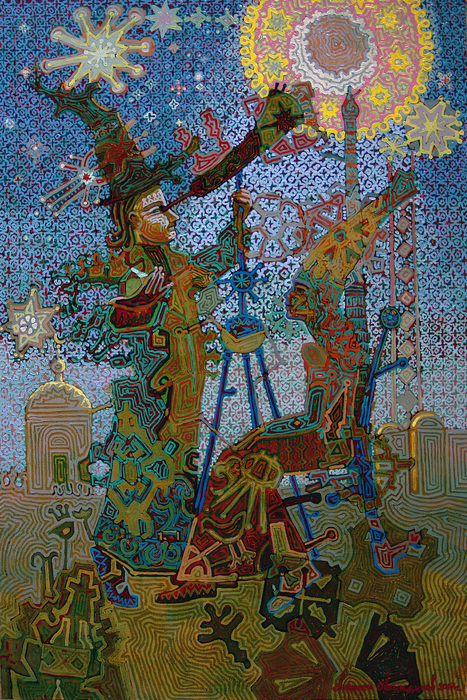 2011 - Gold medal "SAINT MICHAEL" the New York Academy of Art, the category of "historical painting", winner of the International exhibition-contest "The international wave in the visual arts." Venue "ASA Art Gallery", Broadway, New York. 2012 - Fellow of the Ministry of Culture of Russian Federation. 2013 - Winner of the contest "The best product of 2013". 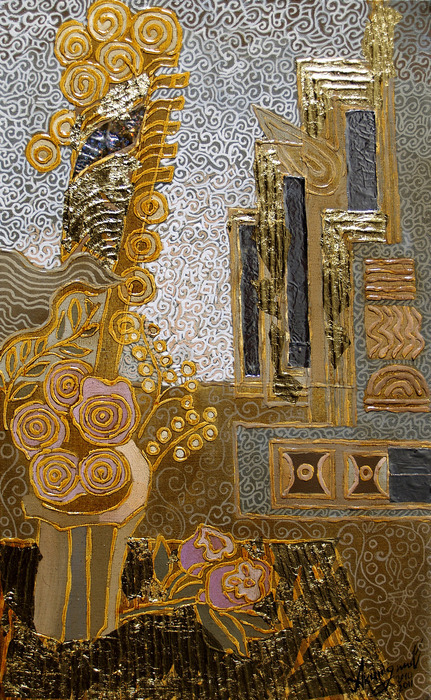 Diploma of I degree for participation in international thematic art project "ornamentalism. Terraincognita. »The Department of Culture of Moscow, State Exhibition Hall" On Kashirke "(Moscow). 1989 - launched the exhibition activities at the regional exhibition "I paint the world", "Exhibition Hall of Artists Union", Ryazan. He was awarded a diploma "For the best work on display." Since 1998 - participant of regional exhibitions. 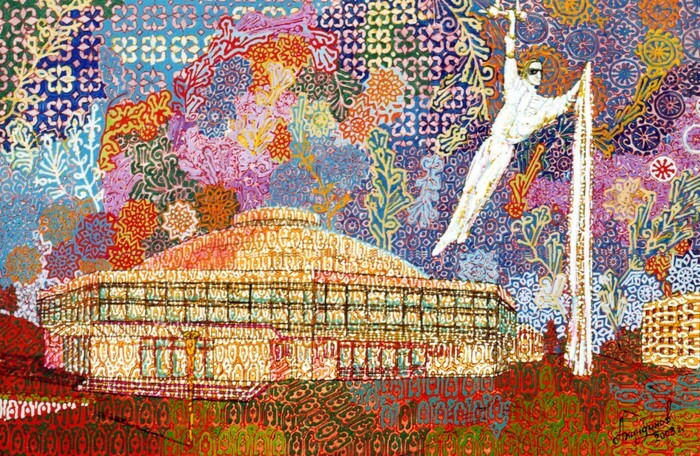 Since 1999 - participant of the All-Russian exhibitions. Since 2005 - member of international and foreign exhibitions. 1999 - "Russia - 9", Moscow - CEH - "Arena". 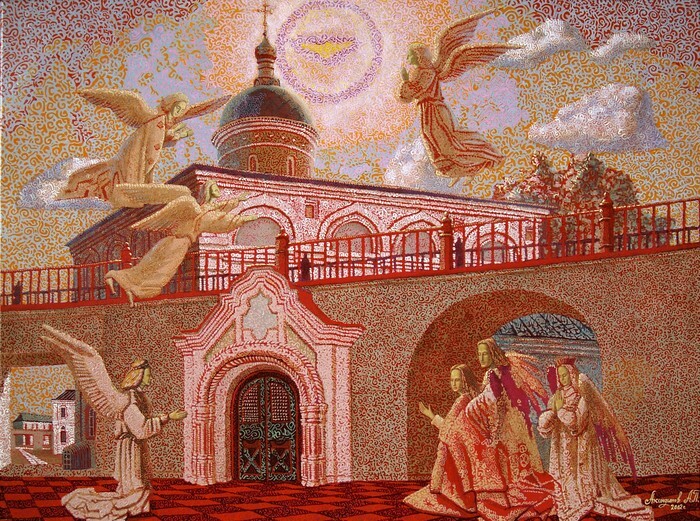 2000 - "Renaissance", the city of Kostroma. 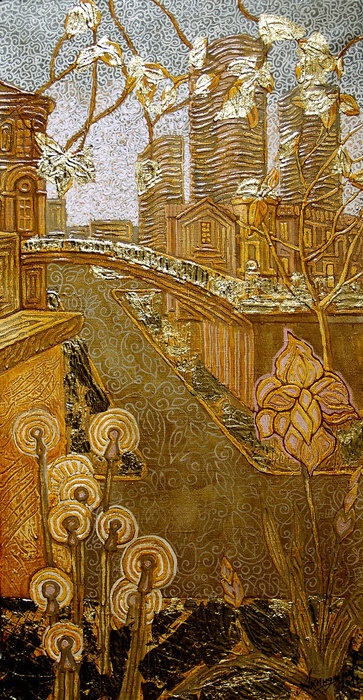 2000 - "Boldin Autumn", Moscow - CHA. 2000 - "Thy Name", Moscow - CHA. 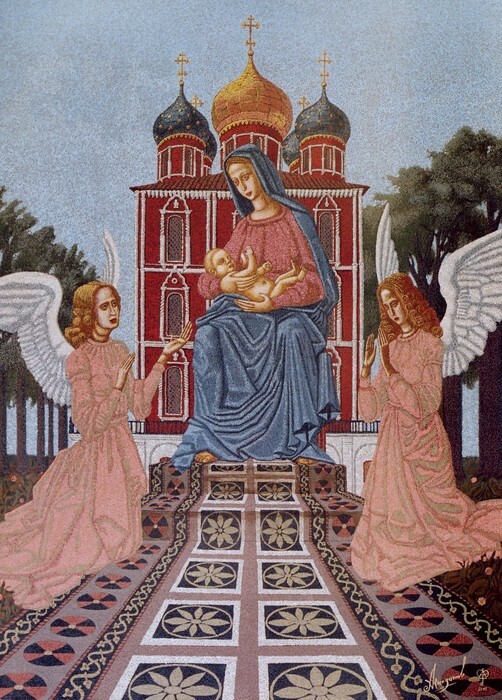 2003 - "Day of the Slavic Written Language and the saint - Mitrofanii miracle worker", Voronezh. 2004 - "The glorious sons of the Fatherland", Moscow - GRDNT. 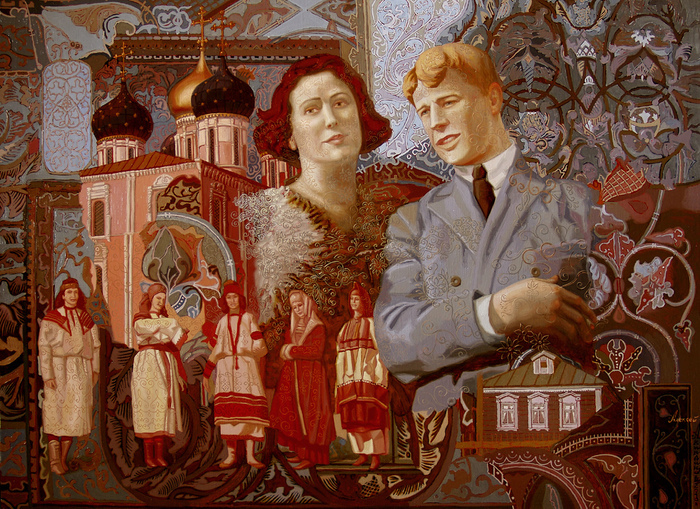 2007 - "Young Artists of Russia" - the All-Russia Youth Exhibition, dedicated to the 250th anniversary of the Russian Academy of Arts, Moscow - CHA. 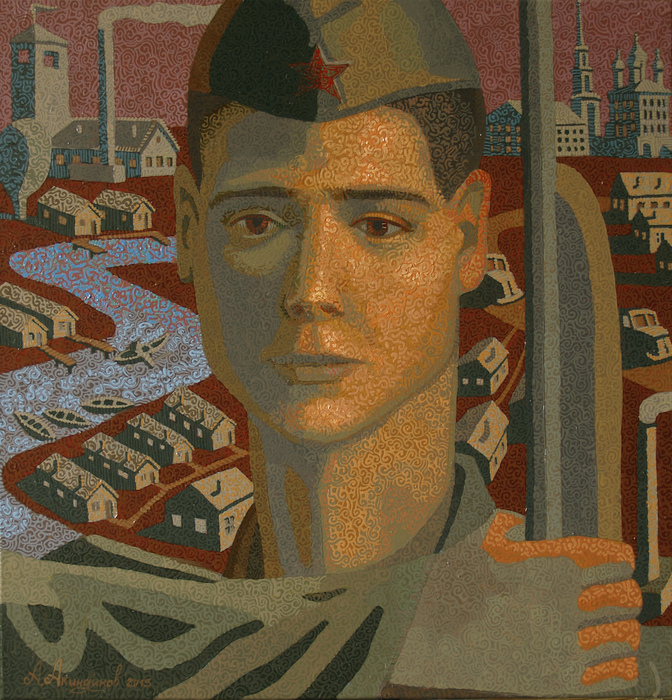 2008 - "Youth of Russia" - Inter-Regional Art Exhibition, Saratov. 2010 - The All-Russia Youth Exhibition, Moscow - CHA. 2013 - All-Russian exhibition "On sports, you - the world! ", Dedicated to the World Summer Universiade in Kazan and the Winter Olympic Games in Sochi. Kazan - Gallery of Modern Art of the State Museum of Fine Arts of the Republic of Tatarstan. Of 2013-2014. - All-Russia Exhibition "Sports-Arts-Sochi", devoted to the Winter Olympic Games in Sochi. Venue - Sochi, Sochi Art Museum. 2016 - III All-Russian art exhibition "Science and space for peace. 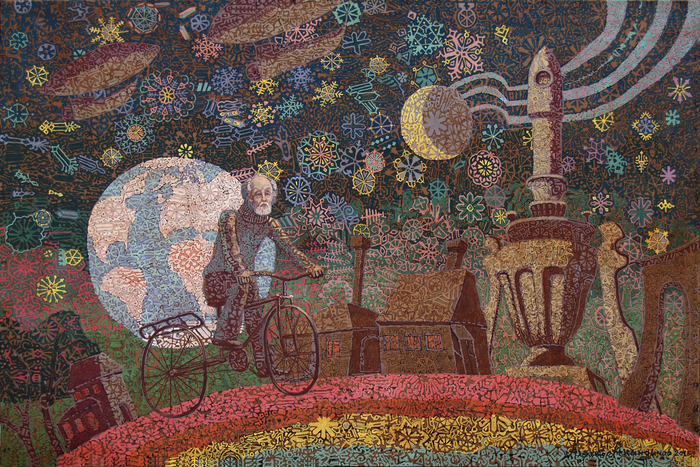 Tsiolkovsky - Korolev - Gagarin ". Smolensk "Cultural and Exhibition Center named Tenishevs", April 14 - May 10. 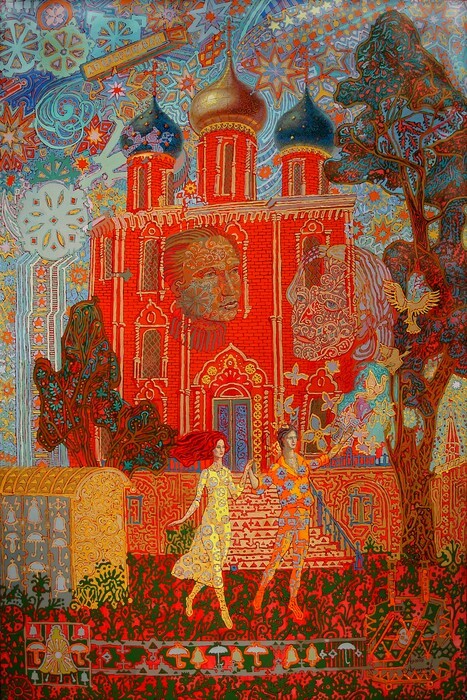 2007 - "Art - Salon", a group exhibition of the Assembly - "Russian Gallery XXI century", Central House of Artists. Moscow. 2007 - Exhibition - Competition - "2nd Moscow International Week of Arts» - «RUSSIAN ART WEEK / ASSEMBLY OF THE ARTS", the Moscow House of Artists. 2007 - "the V exhibition - contest name of Victor Popkov," "International Art Fund, the Moscow Association of Artists of the IHF," "House of Cinema". Moscow. 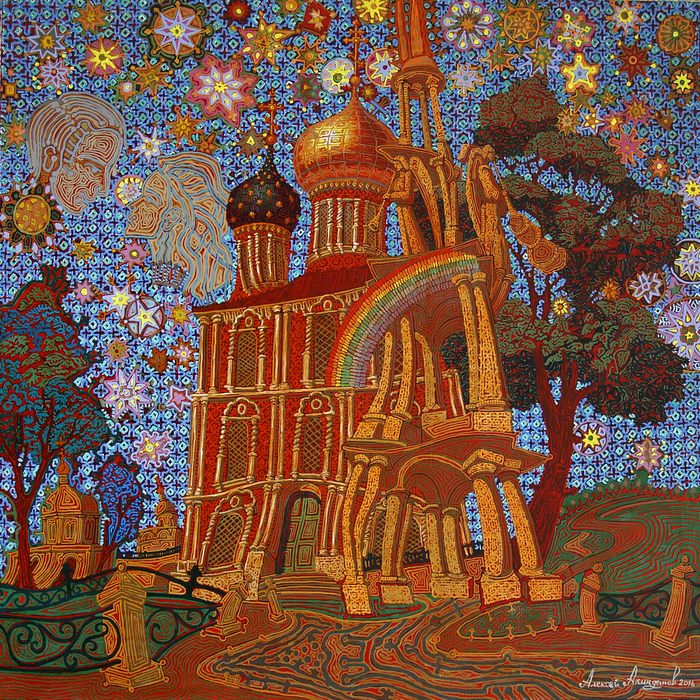 2007 - Moscow group exhibition - "The Feast of the Capital", dedicated to the 850th anniversary of Moscow. Exhibition Hall - "Gostiny Dvor". Moscow. 2008 - Collective exhibition Winner of the "Russian gallery XXI century", the Museum of the Great Patriotic War. Moscow. 2010 - Collective exhibition of the magazine assembly «Studio D'Anturage» - «Link of Times", CHA (Hall №17), Moscow. 2013 - The international art project "ornamentalism Terra Incognita.." State Exhibition Hall "Na Kashirke". Moscow. 2016 — the exhibition devoted 30 — summer anniversary of the Chernobyl accident "Kyshtym and Chernobyl: tragedy, feat, prevention". Cheboksary, the Chuvash national museum (on April 26 — on May 15). Since 1998, he spent more than twenty personal exhibitions in Moscow and Ryazan. 1998 - Ryazan Art School. GK Wagner. 2000 - "All the pattern" - Museum of the History of the youth movement, Ryazan. 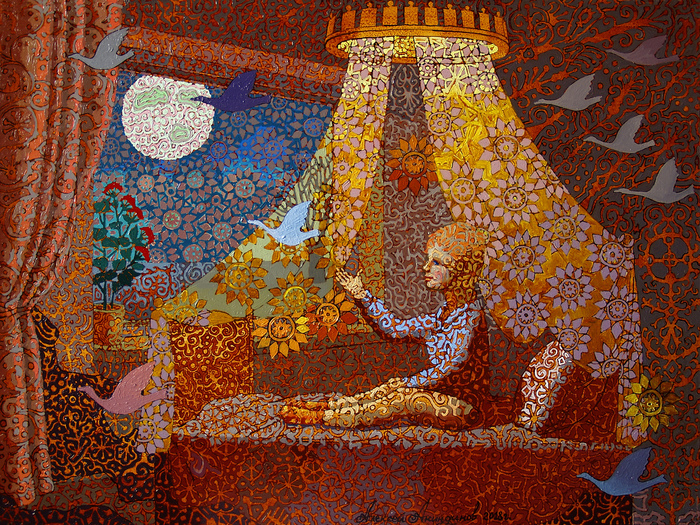 2003 - Gallery "Union - Creativity" - "Memories of Childhood", Moscow. 2003 - "The State Museum - Reserve SA Esenina "in Konstantinov, Mr. Fish. 2003 - "The State Museum of Local Lore", Sasovo. 2004 - Gallery "Union - Creativity" - "keys of Mary", Moscow. 2006 - "fancy." Group exhibition. Ryazan Drama Theatre. 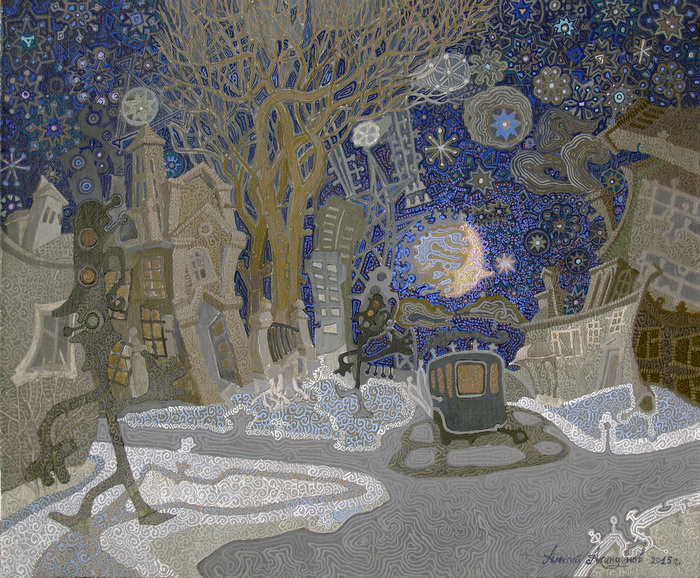 2009 - The Gallery Art Salon "Palette" - "painting by Alexei Akindinova", Ryazan. 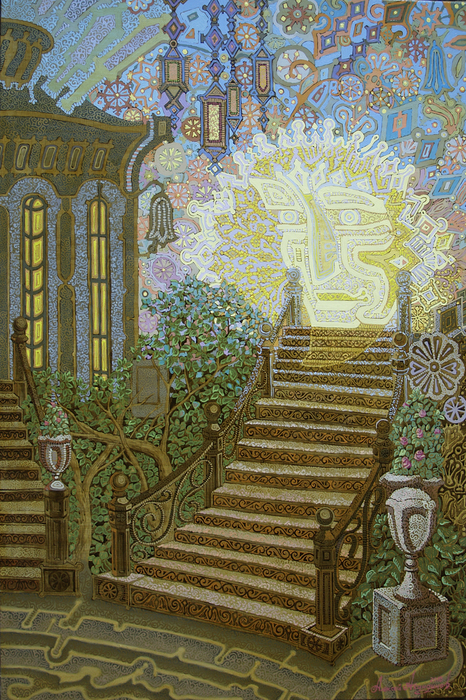 2010 - The Art Gallery - interior "Palette" - "ornamentalism 2010" (collective international exhibition), Ryazan. 2013 - Museum of the History of the youth movement, Ryazan. "Under the guise of ornamentalism". 2016 - Zakharovsky Local History Museum - "My Little Homeland", Zakharovo, Ryazan Region. 2016 - Exhibition Hall of the Historical and Art Museum - "Patterns", Lukhovitsy, Moscow Region. 2005 - (5 - April 20) - Germany, Münster. 2005 - (October 20 - November 19) - USA, Oklahoma, Tulsa - «Curtain's Up. Russian Art Past & Present »-« The curtain rose. Russian art - past and present. " Venue - «Tulsa Performing Arts Center Gallery». 2010 - (15 September - 5 October) Berlin, Germany. Collective exhibition from the collection of "Russian Gallery HHIvek" Russian House of Science and Culture in Berlin. 2011 - (2 - January 16) - New York, USA. "The International Wave of Fine Arts" International Competitive Exhibition ( "International Wave in Art"). Venue - "ASA Art Gallery", Herald Center Mall, 3rd Floor, 1293, Broadway, New York, NY 10001. "Historical and Art Museum", Lukhovitsy, Moscow Region. Sasovo History - Local History Museum - Sasovo, Ryazan Region. Zakharovsky Museum of Local History, Zakharovo, Ryazan Region. Art Center "Keeper" - Kstovo (Nizhny Novgorod region). Earlier in the collections of galleries "Murtuz", "ASTI" - Moscow. Private collections in Russia: Ryazan, Stavropol, Moscow - a private collection of the director - Mark Zakharov, Votkinsk. Log Assembly: "Russian Gallery XXI Century" and "Studio, D'Anturazh" - Moscow. Florence, Italy - private collection of the designer - Roberto Cavalli. USA: Tulsa (OK), Miami (FL). "Gallery of Russian Art Ming Li," Beijing, China. Earlier in the meeting gallery: "ROUEN" - the United States, Oklahoma, Tulsa. This album contains my painting style ornamentalism for twenty years - since 1996 year. Our world is run through electromagnetic waves. Wave is a pattern. The whole world consists of these ornaments. I bear them on canvas using brushes and paints. Picture "Bus-stop "Ryazan patterns" from the “Province” series, 75,5x60 cm, a canvas, oil, 2015-2016. High moments. Modern ballet (picture entirely), 100,5x155cm, canvas, oil, 2015. I, 70,6x70 cm, canvas, oil, 2015 year of establishment. “Intercession of the Theotokos”, canvas, oil, 80x50 cm, 2015. My grandfather Vasily, 46x45cm, canvas, oil, 2015. "Evening" of the diptych "Four days," 105x70 cm, oil on canvas, 2015. "Morning" of the diptych "Four days," 105x70 cm, oil on canvas, 2015. 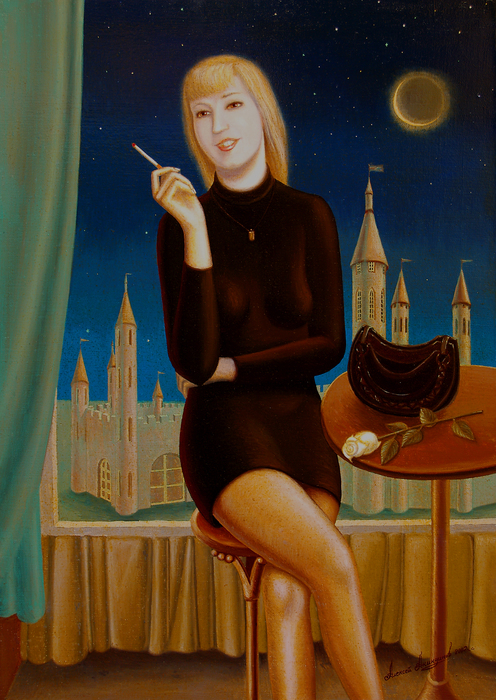 Stargazer Gothic, 50x40 cm, oil on canvas, 2015. "Dancing crossroads", 47,3x58,5 cm, acrylic on canvas, oil, 2015. "Chernobyl. Last Day of Pripyat". The accident at the Chernobyl nuclear power plant April 26, 1986. 120x180 cm, oil on canvas. In 2013-2014. 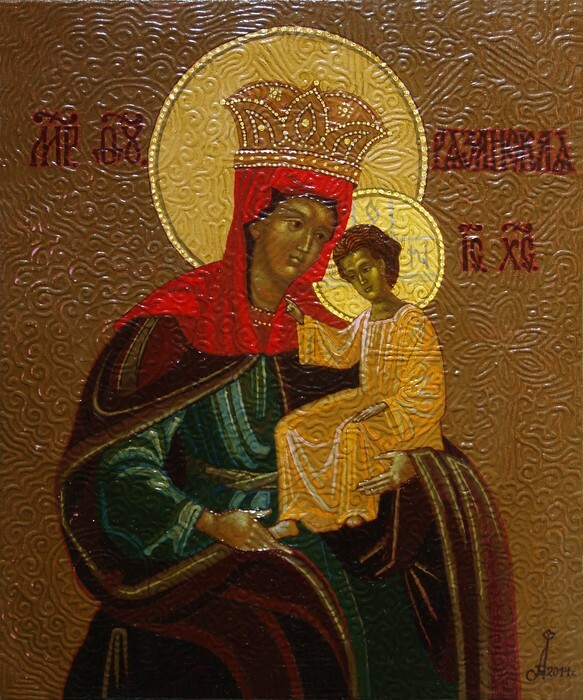 Mother of God Ryazan, 60x50 cm, oil on canvas. 2014 creation. "A still life with a vase", 60x50 cm, a canvas, oil. 1993-2013. "A still life with a mask and a cup", 60x50 cm, a canvas, oil. 1993-2013. "Lenin in January". 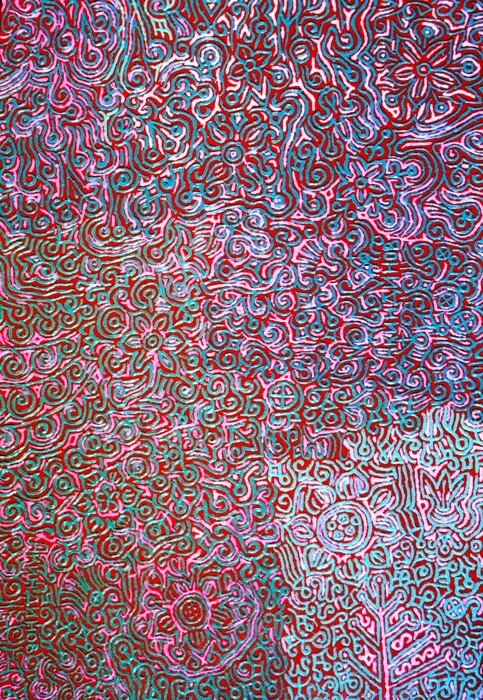 152x122 cm. Canvas, oil. The 2013. "Vivat Vita! ", «Long Live Life!" 150x100 cm, oil on canvas. 2012. Grand Canyon. 70,5x287,7cm, canvas, oil, 2012. 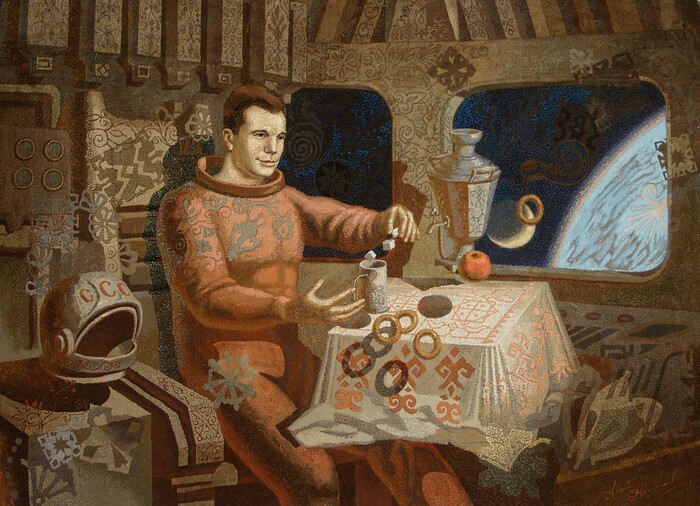 Gagarin's breakfast. 83,5x115,5 cm, canvas, oil, 2011-2012. Electrician of dreams. 50x35 cm, canvas, oil, 2011. "To Chaine of the Ryazan Kremlin", 100 x 100 cm, canvas, oil, 2015-16. 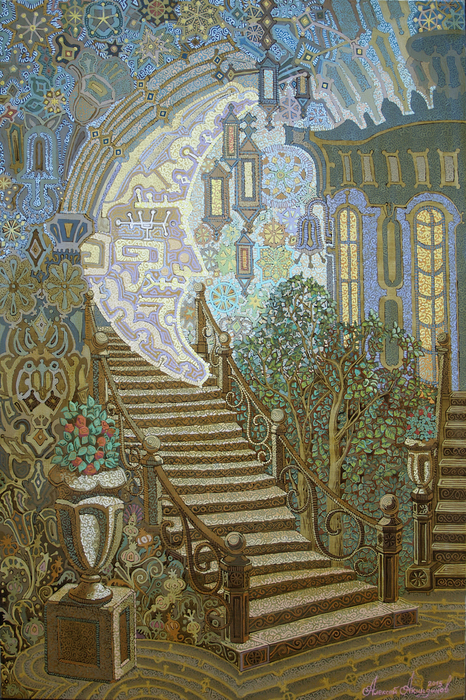 "Dawn arabesques" 2011, 48 x 62,5 cm, canvas, oil. 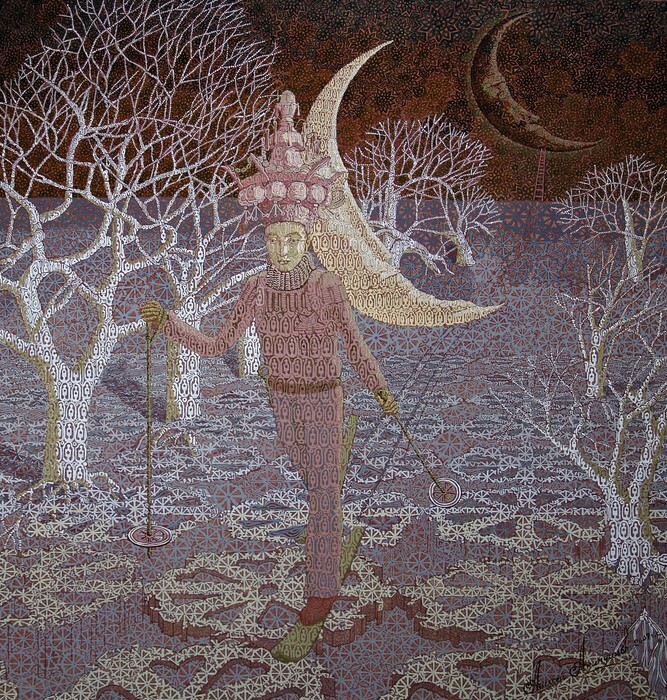 Lunar swing, 2011, 40 x 60 cm, canvas, oil. 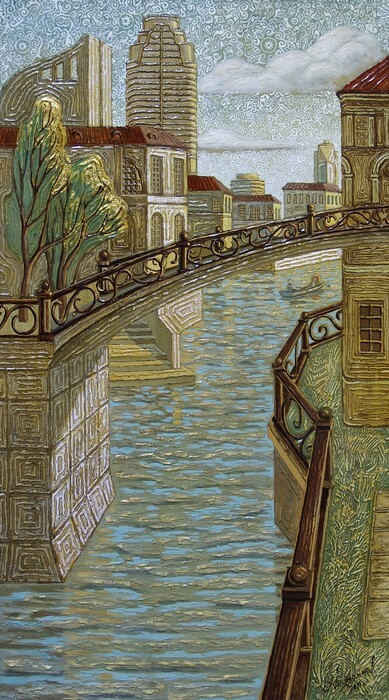 The bridge through river Oka with a kind to the Ryazan Kremlin, 2011, 50 x 180 cm, canvas, oil. 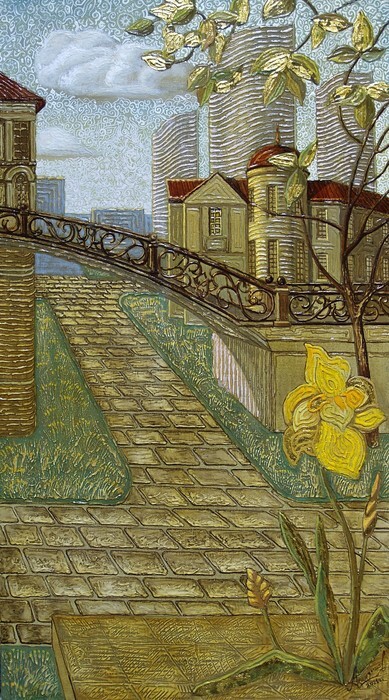 City landscape #1, 2011, 90 x 50 cm, canvas, oil. City landscape #2, 2011, 90 x 50 cm, canvas, oil. Moulin Rouge, 2011, 90 x 90 cm, canvas, oil. Ice knights. 2010-2011. 100x182.5 cm, canvas, oil. Tetraptych «My New York». 2011, 53x40 cm, canvas/oil/gilding. Tetraptych «My New York». 2011: Old Brooklyn. 36.5x70.5 cm, canvas/oil/gilding. Esenin and Isadora. 2010. 80.5x110.5 cm, canvas/oil. The Juno and perhaps. 2010. 65x83 cm, canvas, oil. 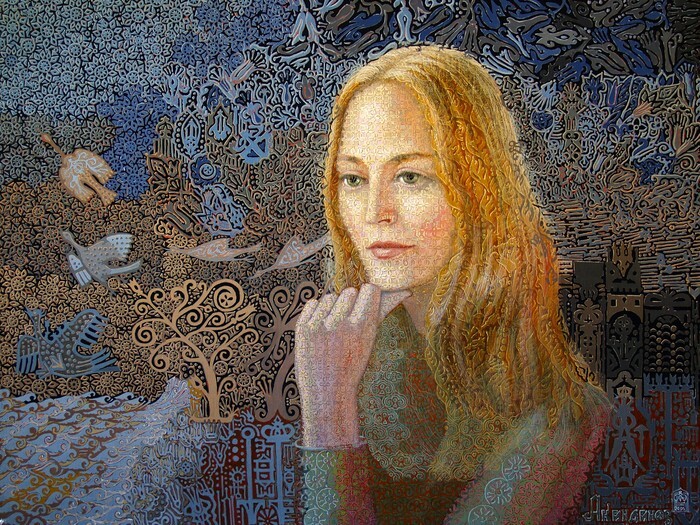 Portrait of Alla Pugacheva. 2010. 60.7x47.5 cm, canvas, oil. Portrait of Aminat. 2010. 91.5x72.5 cm, canvas, oil. The daughter of morning light. Portrait of Anastasija Kolskaja. 2010. 61.8x48.5 cm, canvas oil. Portrait of the young man with a dog and a parrot.. 2010. 70x50 cm, canas, oil. Martin Luther King. 2009-2010. 100x80 cm, canas, oil. Self-portrait under a dogrose bush. 1995-2010, 137.2x96.5 cm, canvas, oil. Motherhood. 2009, 180x200 cm, canvas, oil. Beauty echelon. Elena. 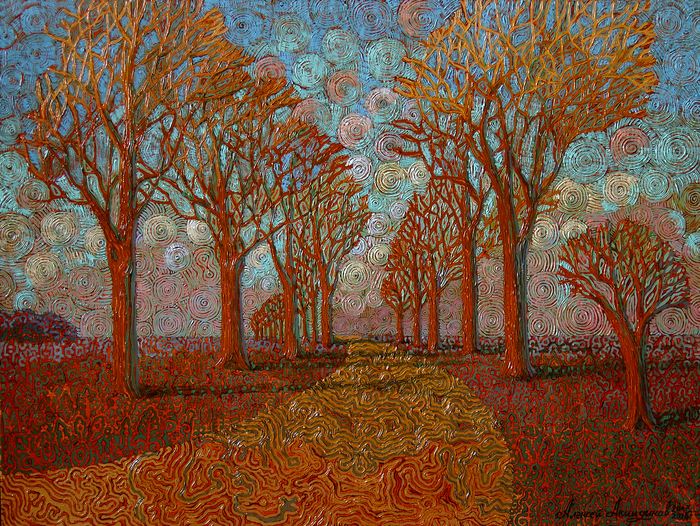 2009, 55x90 cm, canvas, oil. Caution, The Moon! 2009, 50x35 cm, canas, oil. Portrait of Sergey Preobrazensky. 2009, 70x70 cm, canvas, oil. Declaration of love. 2009, 50x70 cm, canvas, oil. The naked girl. 2009, 60x50 cm, canas, oil. The still life with the peach. 2009, 59.8x49.7 cm, canas, oil. The still life with the head of Aphrodite. 2009, 50x60 cm, canvas, oil. The Dance Of The Death, 2008 - 2009, 105.3x130.3 cm, canvas, oil. Patterns of morning appointment. 1998 - 2009, 50x60 cm, canvas, oil. Yesenin. 2008, 70x50 cm, canvas, oil. A Portrait Of Vladimir V. Putin. 2008, 50x60 cm, canvas, oil. The moon park. 2007, 50x100cm, canvas, oil. Triptych «Savanna». 2007: The lion scares birds. 2007, 35x55cm, paper/acryl. Triptych «Savanna». 2007: The winged wolf. 2007, 35x55cm, paper/acryl. Triptych «Savanna». 2007: The giraffe's family. 2007, 35x55cm, paper/acryl. The moon hunter. (The portrait of Dmitry Kuvaev.) 2007, 90.2x80.3cm, canvas, oil. The vision of Iezekiil. 2006, 92.8x59.5cm, canvas, oil. The hockey fan. 2006, 60x50cm, canvas, oil. Station «Childhood». 2006, 70x50cm, canvas, oil. Town moments. 2006, 50x70cm, canvas, oil. Dmitry&Dmitry - echo of genealogical infinity. 2006, 30.5x40.2cm, canvas, oil. Raspberries. 2006, 50x60cm, canvas, oil. The clone and the religion. 2006, 40x80cm, canvas, oil. Contemplation. 2006, 80x60cm, canvas, oil. Rose's dance. 2006, 50.5x60.5cm, canvas, oil. France Cinema Star. A Portrait Of Anna Pahomova. 2005-2006, 31.5x24.5cm, canvas, oil. The Midnight. 2005-2006, 55.5x70.5cm, canvas, oil. Banks Of Wishes. 2005, 63x84cm, canvas, oil. 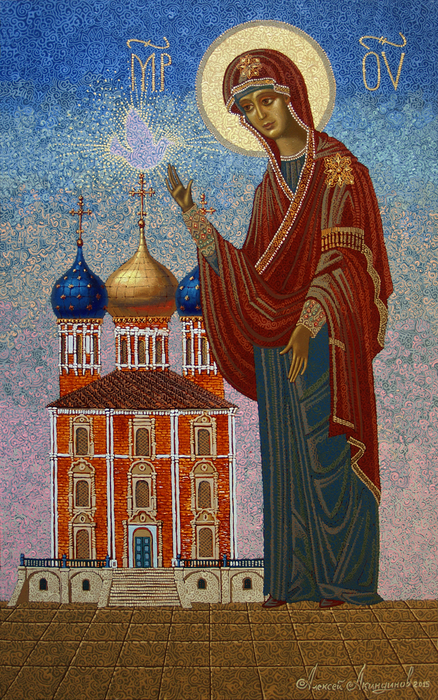 Madonna Of Ryazan. 2005, 100x80cm, canvas, oil. "IKARUS" & a Fireman. 2005, 35.9x58.3cm, canvas, oil. A Portrait Of Zaur Nurbagandov. 2005, 30x25cm, canvas, oil. Snowiness. 2005, 89.8x78.2 cm, canvas, oil. The Blessed Glory. 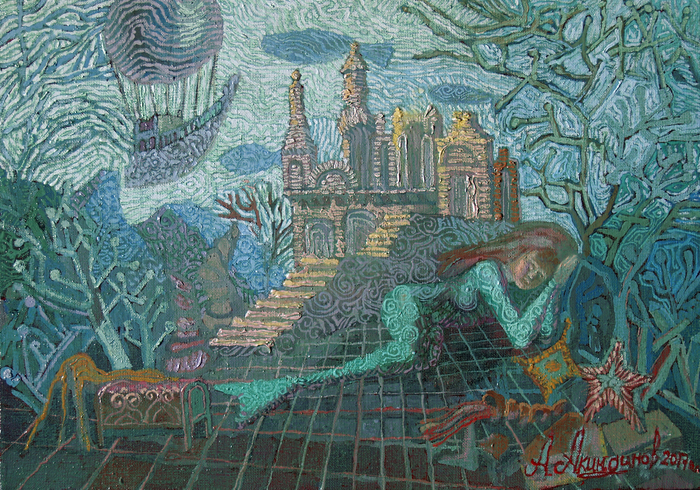 2004, 66.2x53.2 cm, canvas, oil. Aurora. 2004, 35.9x58.3 cm, canvas, oil. My Grandfather Vasilyi. 2003-2005, 46x45 cm, canvas, oil. Iakov's Dream. 2004, 64x52 cm, canvas, oil. The Esenin's Morning #2. 2004, 40x50 cm, canvas, oil. "...Indescribable, Blue, Soft..." 2003-2004, 66x44 cm, canvas, oil. "Snowy Queen", the sketch. 82x41 cm, canvas, oil. Snowy Queen. 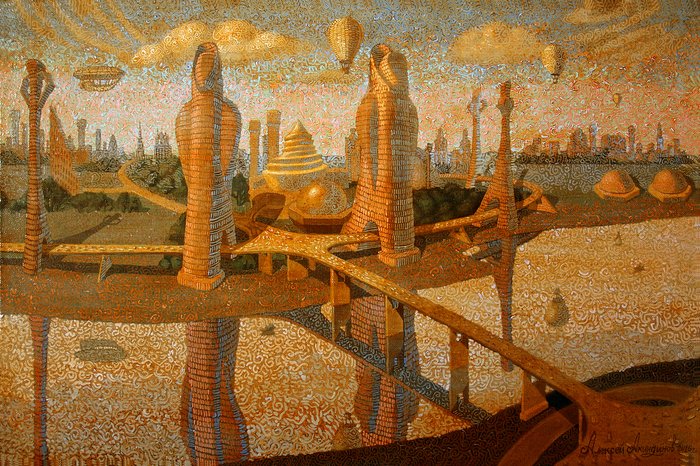 2003-2004, 171x71 cm, canvas, oil. The Conductor. 2003, 50x60 cm, canvas, oil. The Birth of Titanus. 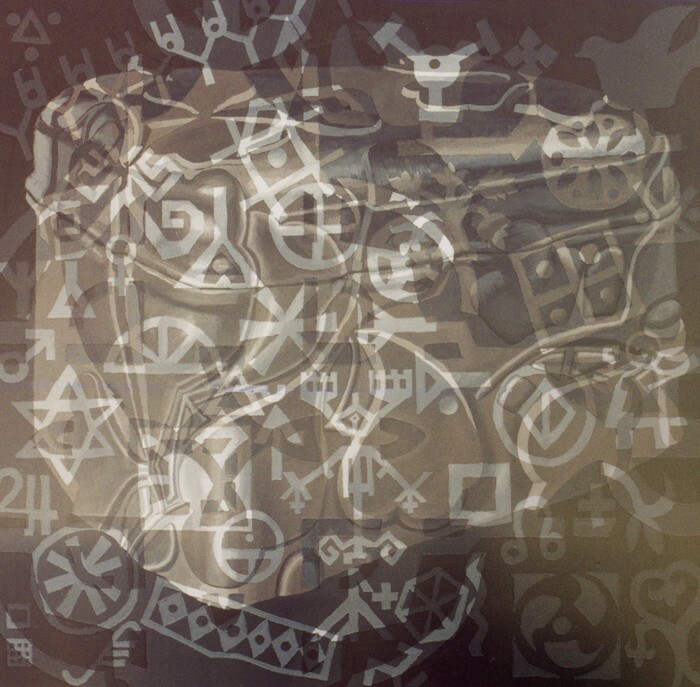 2003, 105x210 cm, canvas, oil. Political Figure. 2002-2003, 115.5x83.5 cm, canvas, oil. The Box of Secrets # 0. 2002-2003, 114x117 cm, canvas, oil. The Box of Secrets #1. 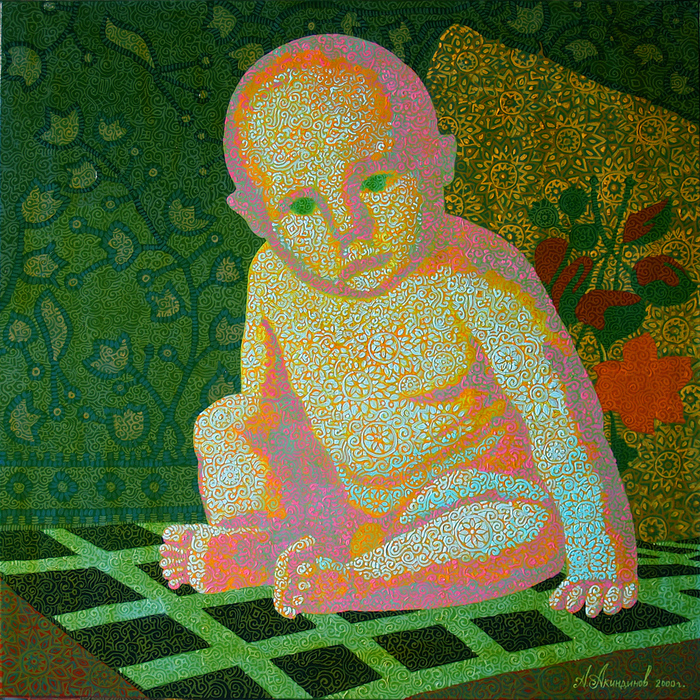 2002-2003, 114x117 cm, canvas, oil. Mr. X. Air equilibrist Valery Panyushkin. 2002-2003. 35x50 sm. canvas, oil, acryl. Innocent person. 2002, 68x46.2 cm, canvas, oil. Alfa & Omega. 2002, 60x80 cm, canvas, oil. The Angel of Seven Churches. 2002, 73x51 cm, canvas, oil. The Winds. 2002, 60x76 cm, canvas, oil. Quiet. 2002, 60x80 cm, canvas, oil. Black River. Alexander Pushkin before duel. 2002, 71x71 cm, canvas, oil. Scarf-bird. 2002, 60x120cm, canvas, oil. Stargazer. 2001-2002, 137x118 cm, canvas, oil. Stargazer - contemporary. 2001-2002, 90x75 cm, canvas, oil. The City. 2001-2002, 78x78 cm, canvas, oil. Awaiting. 2001-2002, 73x92.5 cm, canvas, oil. The Frost. 2001, 72.7x80 cm, canvas, oil. The Sign. 2001, 48x59.5 cm, canvas, oil. Notice It. 2005-2006, 55.5x70.5 cm, canvas, oil. The Sward. 2001, 87.5x62 cm, canvas, oil. The Bliss. 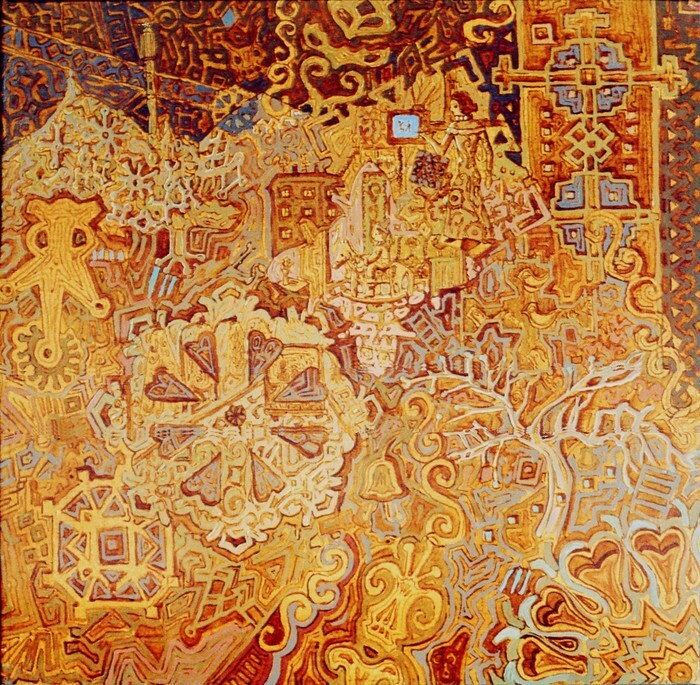 2001, 62x87.5 cm, canvas, oil. Discovery. 2001, 63.5x57.5 cm, canvas, oil. The Benefit. 2001, 62x67 cm, canvas, oil. The Churchyard. 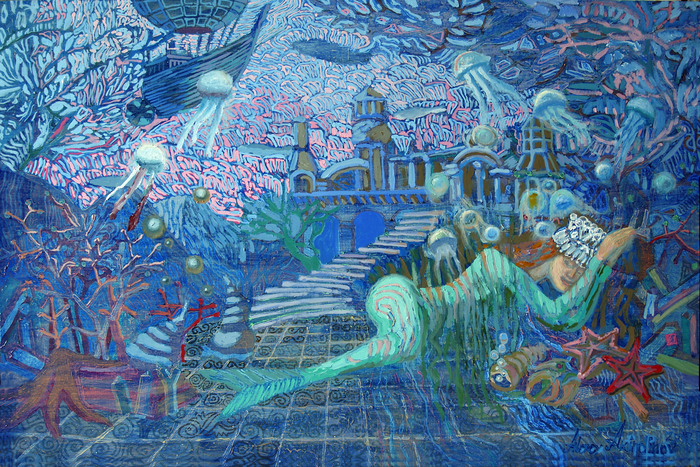 2001, 93x59.8 cm, canvas, oil. Solemn. 2001, 53x58cm, canvas, oil. Crown of Thorns. 2001, 71.5x58cm, canvas, oil. The sketch to the picture «Mama». 2000, 35x35cm, wood, oil. Stargazer is underwater. 2000-2001, 60x80cm, canvas, oil. The Swell. 2000-2001, 55x63.5cm, canvas, oil. Favourite. 2000, 68x68cm, canvas, oil. The Life. 2000, 62x62cm, canvas, oil. Mama. 2000, 96.5x96.5cm, canvas, oil. The Safecracker. 2000, 64x52cm, canvas, oil. The Pray. 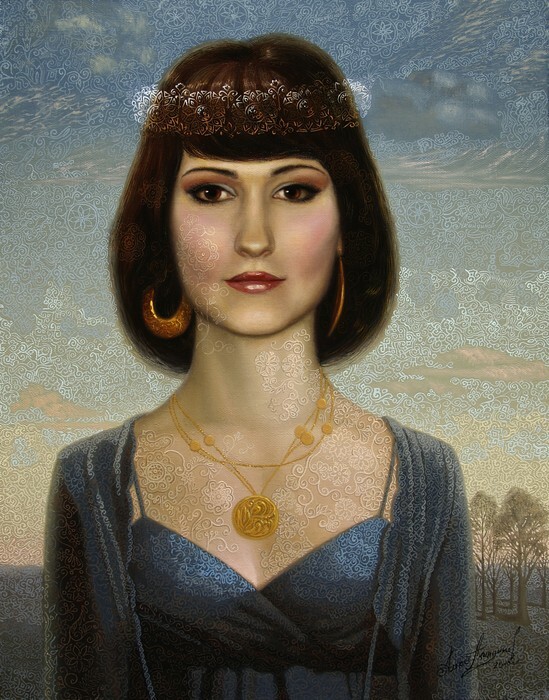 Tatyana Evstegneeva's portrait. 2000, 58.5x48.5cm, canvas, oil. The Perfume. 2000, 48x48cm, canvas, oil. The first. Yury Gagarin's portrait. 2000, 47.5x68cm, canvas, oil. Tractor operator. The Portrait of Father. 2000, 48x56cm, canvas, oil. Guardian. 2000, 60x50cm, canvas, oil. 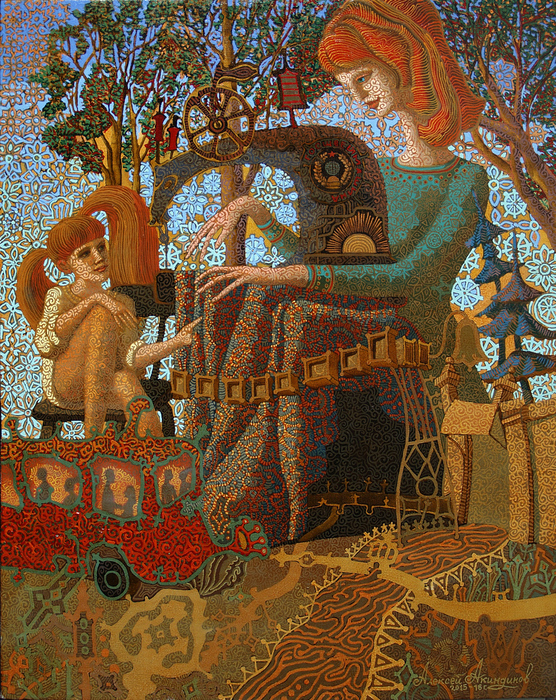 The Seamstress. 2000, 88x68cm, canvas, oil. Me & You. 2000, 50x60cm, canvas, oil. The Clone. 1999-2000, 60.5x40.5cm, canvas, oil. The Pall. 1999-2000, 71.5x43.5cm, w/met/p/l. The Mine. 1999-2000, 61x75cm, canvas, oil. The Festival. 1999, 72x89cm, canvas, oil. The Zerro. 1999, 75x90cm, canvas, oil. The Seaman. 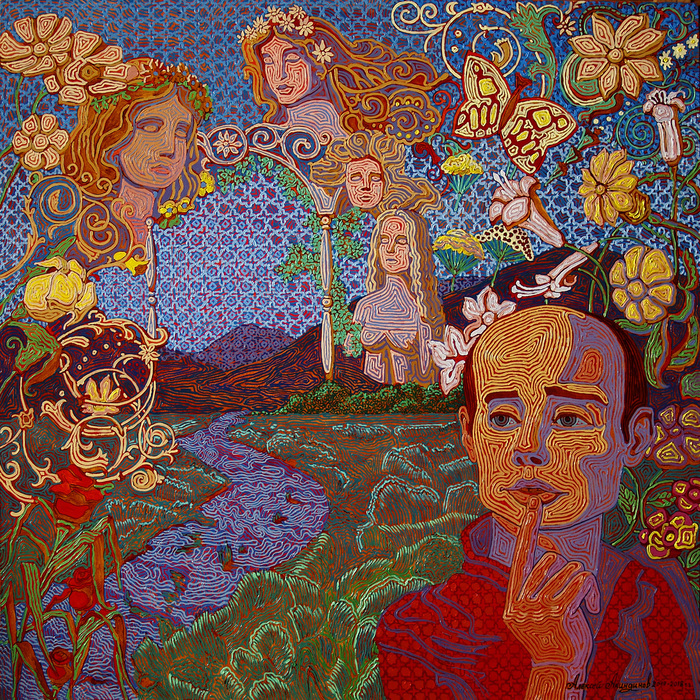 1999, 64x91cm, canvas, oil. No. 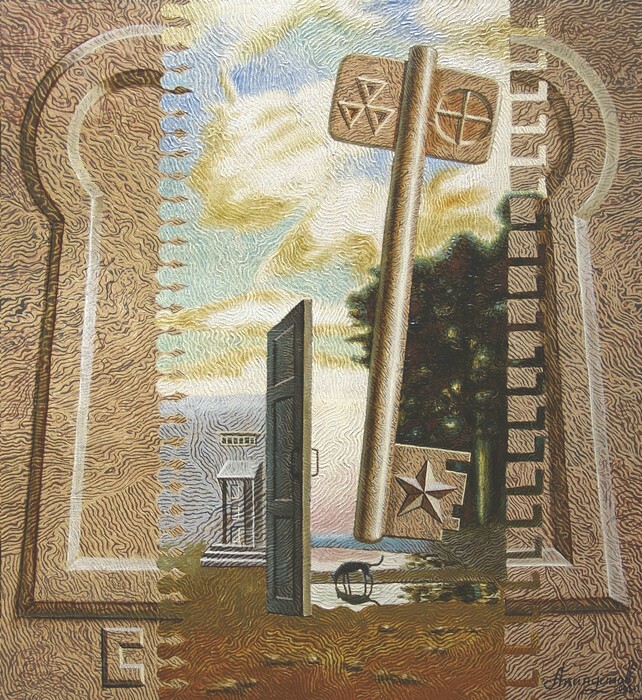 1999, 58x78cm, canvas, oil. The Electrician. 1999, 67x86.5cm, canvas, oil. Walking Child. 1998-1999, 61x80cm, canvas, oil. The Frost. 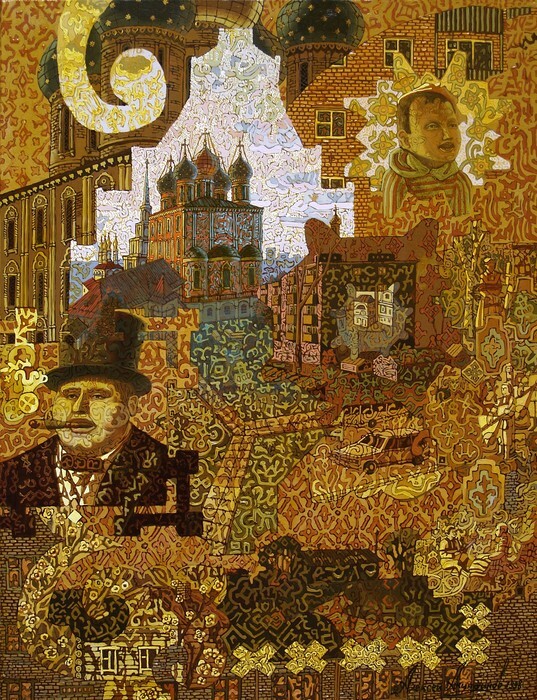 1998-1999, 56.5x76.5cm, canvas, oil. Geranium Guy. 1996-1999, 123x113cm, oil-cloth/oil. Geriki. 1998, 115.5x83.5cm, canvas, oil. The House of Family Life. 1998, 78x44.7cm, canvas, oil. The Blacksmith. 1998, 45x60cm, canvas, oil. The Labyrinth. 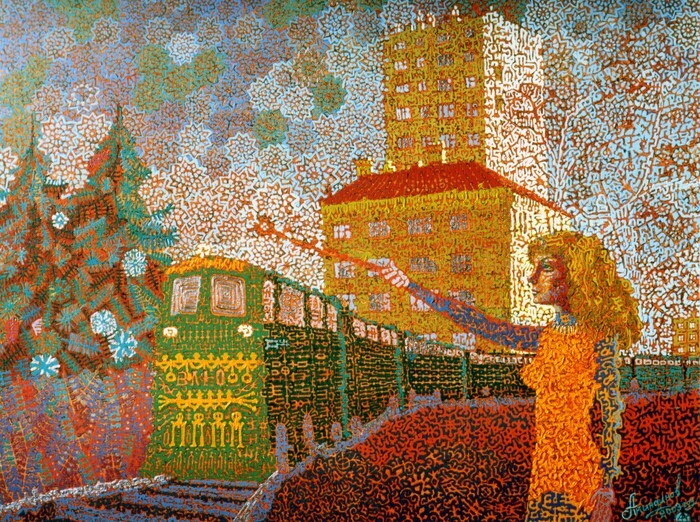 1998, 73.9x57.4cm, canvas, oil. Listen. 1998, 50x60cm, canvas, oil. Nothern Night. 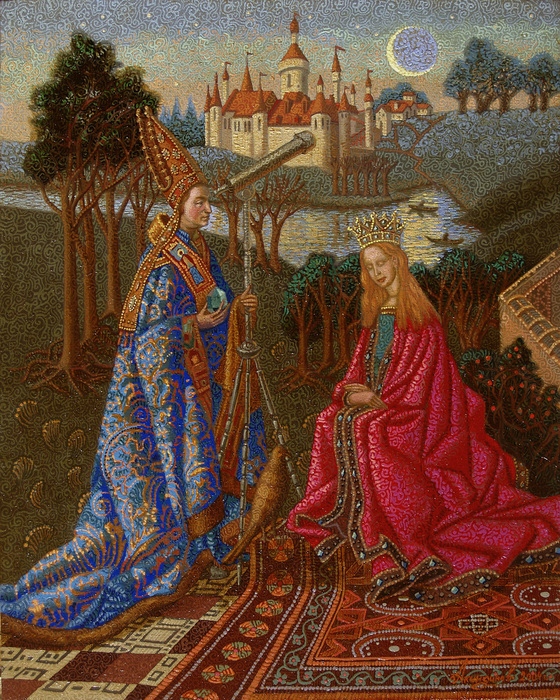 1998, 38.5x51.7cm, canvas, oil. A Boy Dreams About Yards. 1998, 56.5x62cm, canvas, oil. Triumph. 1998, 50x40cm, canvas, oil. The Patterns of the Even Date. 1998, 40x50cm, canvas, oil. The Esenin's Morning. 1998, 40x50cm, canvas, oil. The Drift of Cupel. 1998, 44x44cm, canvas, oil. Stargazer. Dyploma work. 1998, 182.5x138cm, canvas, oil. Stargazer. The sketch to the dyploma work.1998, 37x28.5 cm, canvas, oil. Russia, Ryazan Future, 59,5x93 cm, oil on canvas, 2016 creation. 70х50 cm, canvas, oil, 2016 year of establishment. Alexey Akindinov's picture "Naked girl, view from a back", 70х50 cm, canvas, oil, 2016. 100 х 150 cm, a canvas, oil, 2016. 100 х 150 cm,canvas, oil, 2016-2017 years of establishment. 60х90 cm, canvas, oil, 2016-2017 years of establishment. 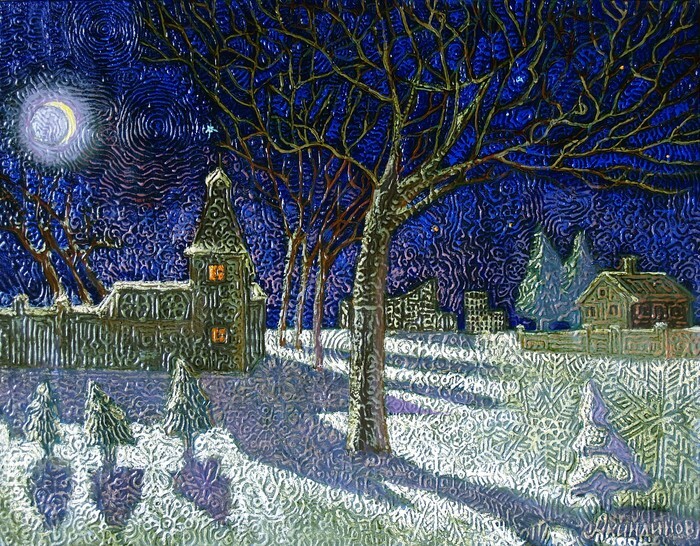 Under the starry sky, 70х50 cm, canvas, oil, 2007. 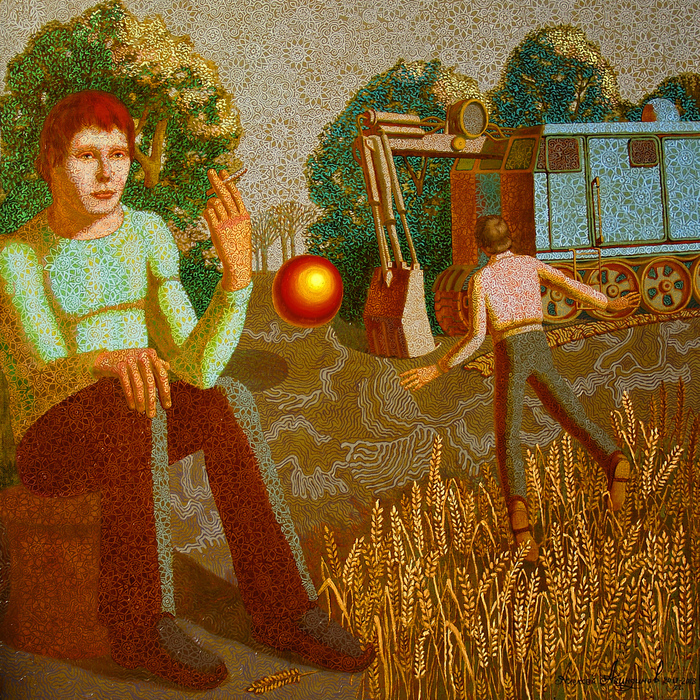 "The Strugatsky Brothers "Picnic on the sidelines", 114х117 cm, oil on canvas, 2017-2018. "Patrick Zuskind," 100x100 cm, oil on canvas, 2017-2018. 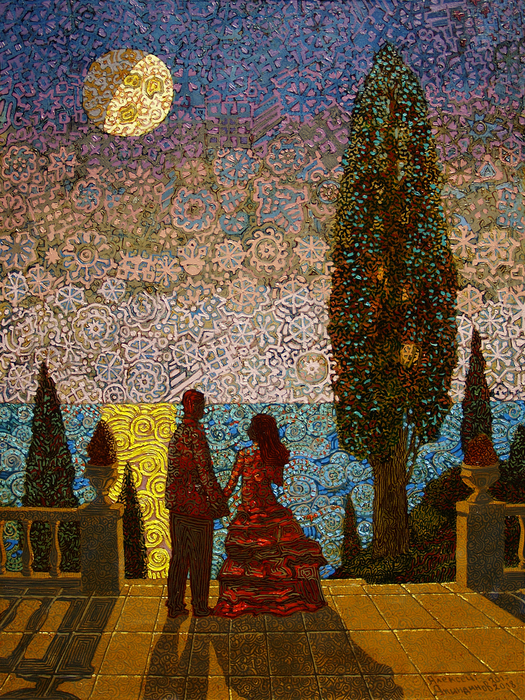 Painting by Alexei Akindinov "Moon Tales", 60х80 cm, oil on canvas, 2018 year.